The kitchen, for a lot of people, is the most important room in the house. It is where you can cook meals, gather with your family at the end of a day, entertain guests and help your kids with homework. With that said, who wouldn’t want their kitchen to be beautiful? If the kitchen is not beautiful and functional it can be a deal breaker to potential buyers. So, think about giving your kitchen a little extra TLC if you’re putting your house on the market. The article below highlights that two-toned color schemes are the hottest trend right now. Use this for some inspiration! Two-toned colored kitchens are gaining popularity this year. White and gray painted cabinets are dominating kitchen color schemes, according to the 2017 Kitchen & Bath Design Trends survey conducted by the National Kitchen and Bath Association. Particularly gray-toned kitchen cabinets are seeing a surge in popularity lately. Other colors are getting mixed in too, adding a little more pizzazz to kitchen design. 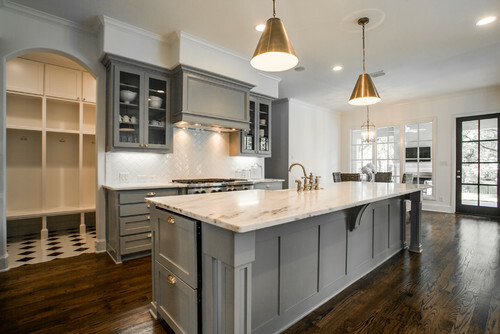 For example, the surrounding kitchen cabinets may be white and then the center island may feature gray cabinets. Or, white cabinets may be on the top and then gray cabinets on the bottom. That said, for the more daring, blue or black-toned cabinets as well as high-gloss finishes are gaining popularity in kitchen designs too, according to NKBAs survey.